THE B-MOVIE NEWS VAULT: New DVDs & Blu-rays for 05/24/2016! Hey Vault Dwellers and fellow collectors of physical media! 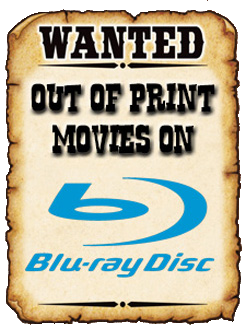 Welcome to another weekly dose of news for the latest genre releases on DVD & Blu-ray! This week is pretty light, but there are some great titles worth picking up from all of your favorite distributors. Scream Factory has just released Michael Mann's MANHUNTER on a nice, Collector's Edition Blu-ray with new artwork and loads of extras! Kino Lorber has put out THE PEOPLE THAT FORGOT on Blu-ray, and ZAPPED! makes it's high-def debut, courtesy of Olive Films! Shout! Factory is polishing off their MST3K collection with a re-release of Volume II of the award-winning comedy series. This set contains a collection of shorts, CAVE DWELLERS, ANGELS REVENGE, and POD PEOPLE. Also, I'd be remiss if I failed to mention Arrow Video's 4-disc Special Limited Edition set of KILLER DAMES: TWO GOTHIC CHILLERS BY EMILIO P. MIRAGLIA. This set includes THE NIGHT EVELYN CAME OUT OF HER GRAVE, and THE RED QUEEN KILLS SEVEN TIMES! There's some other cool flicks out on DVD & Blu-ray today, so scroll down for the full list!